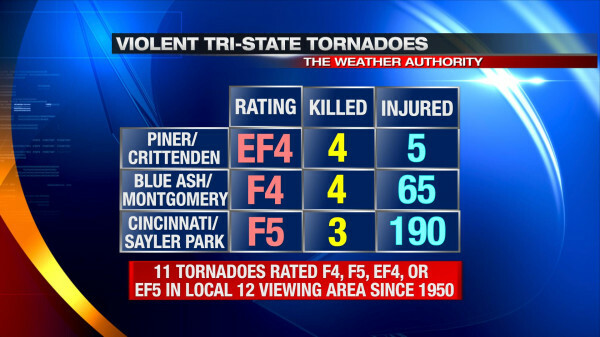 I remember the Blue Ash/Montgomery/Symmes Township tornado on April 9, 1999. I was in Blue Ash that night, and it was the loudest thunderstorm I had ever heard in my life. My home was not hit, but nearby friends’ homes were. In the days after that tornado, I helped clear debris, collect belongings, and provided a shoulder to cry on if needed. The damage was intense, but localized; you can still see evidence from the tornado if you look carefully at the trees across the street from Sycamore High School. That tornado is a big reason why I am a meteorologist today. Before returning to Cincinnati, I tracked numerous severe thunderstorms and tornadoes in the Ohio Valley. I had been in numerous Storm Prediction Center “moderate” or “high” risks before. While last winter was abnormally warm, it wasn’t unusually stormy. Rain would come and go, and there was little to no snow. At the time, I remember meteorologists in this area joking about how boring the weather pattern was. On the Monday before Friday, March 2nd, 2012, I was working the morning shift, and I noted the risk for strong and severe storms on Friday. Before March 2nd, there were other severe weather threats to our south and west. With a slight risk of severe weather (as forecast by the Storm Prediction Center) in place, an EF4 tornado hit Harrisburg, Illinois in the middle of the night on February 4th. News of this violent tornado in late February was – frankly – bit surprising given NWS and SPC forecasts; it also had me on edge regarding the forecast for March 2nd. Where forecast models handling everything correctly? As the week went on, the threat for severe weather on Friday increased in the Ohio Valley, but I remember forecast models keeping a focus for severe weather centered over southwestern Indiana, western Kentucky, and Illinois…in areas that had been hit hard by storms earlier in the week. I remember setting my alarm for 7:45am on March 2nd just to see if the Storm Prediction Center would put us in a high risk. They didn’t at 7:59am, so I went back to bed for a couple of hours. I was into work shortly thereafter. Until about 1:00pm in the afternoon, it was a “waiting game.” No supercells had popped up in our area, but we knew the powerkeg was about to blow. High-resolution models suggested rotating storms and supercells were going to explode in the afternoon, but they disagreed on exactly where. 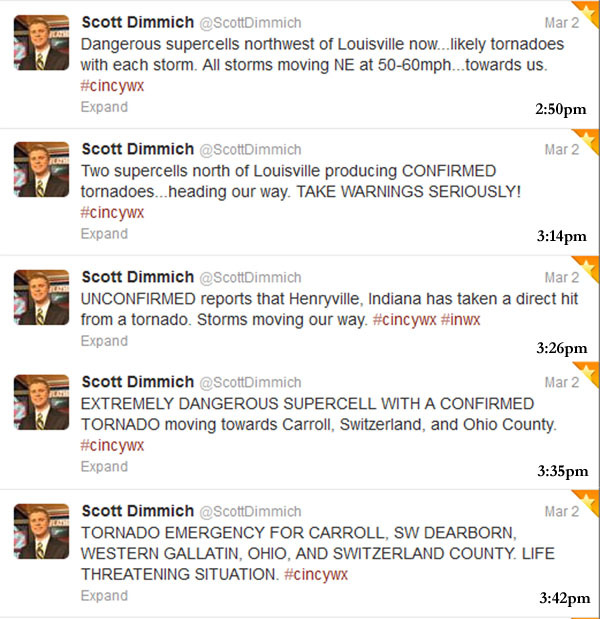 Between and 1 and 2pm, Tim Hedrick and I watched as three different supercells blew up in southwestern Indiana over the span of two counties in less than 15 minutes. When Tim says, “I’ve never seen supercells go up on radar that quick near here. Ever.” you believe him. In 20 minutes, Dubois and Perry County Indiana went from having just cumulus clouds to tornadoes. A lot of the suspense about what was going to happen and where was resolved by 2:30pm in the afternoon; supercells in southern Indiana were producing damage, and there were numerous indications from spotters that the damage was extensive and the tornadoes were strong or violent. As a meteorologist, I knew there was a chance for this to happen, but until it had been confirmed, the magnitude of this event didn’t really hit me. Thankfully, the storm that produced a tornado in Ripley County would quickly die, but this event was just beginning for northern Kentucky and southwestern Ohio. While reports of tornadoes and funnel clouds came in from Carroll, Gallatin, and Owen County, the rotation in the northernmost supercell tightened quickly. The first, second, and only Tornado Emergencies ever issued by the National Weather Service in Wilmington were issued for this cell. Looking back at our severe weather coverage, I noticed my hand and the warning printout I was holding were shaking as I announced the first Tornado Emergency on the air. A family friend of mine several weeks later called me out on my hand shaking. She told me that was her first indication from me that this was going to be bad event. At first, the debris ball (shown at the end of the hook echo in the left side of the above image) wasn’t apparent. Data were only available from the FAA radar every 6 minutes on March 2, 2012, so word of the debris ball first came from the National Weather Service in Wilmington (who could see the radar data every minute). This debris ball on radar was the second sign to me (once storms were in the viewing area) that this would likely be a deadly and historic event. In the over 20 years I’ve lived in Cincinnati, I had never heard of or seen a debris ball on a local radar. This storm went on to hit Moscow and Hamersville, Ohio, producing EF-3 damage and killing 3. Initially, this report of damage in Moscow was delayed; I remember it was at least 20 minutes between Moscow was hit and when we first heard about the damage. 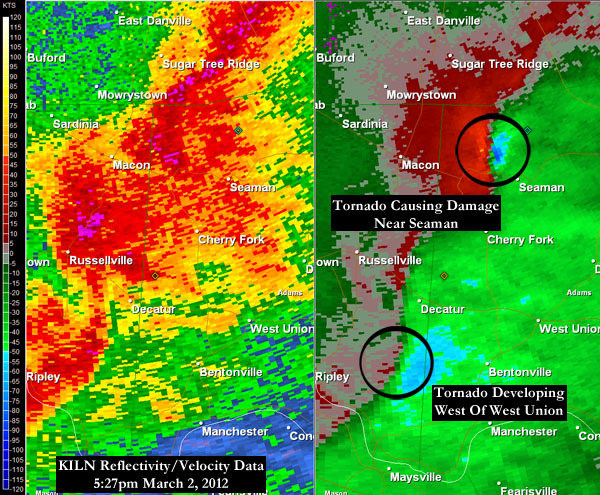 After looking through the data, there are three things that stand out to me about the tornado outbreak of March 2, 2012. For the first time ever, the National Weather Service issued a Tornado Emergency for our area (not once, but twice). A Tornado Emergency is issued when a large, confirmed tornado threatens a highly populated area. Second, three major tornadoes were confirmed in the event. 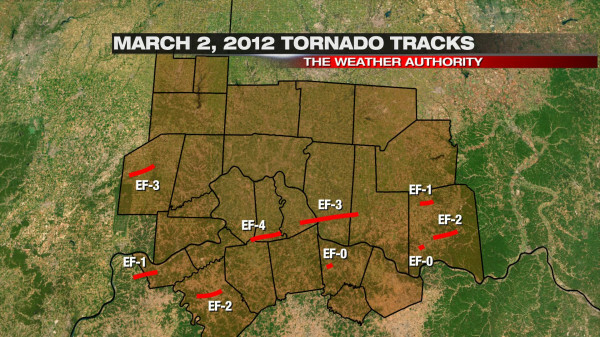 The last time 3 major tornadoes were confirmed in our area on the same day before March 2, 2012 was on April 3, 1974. 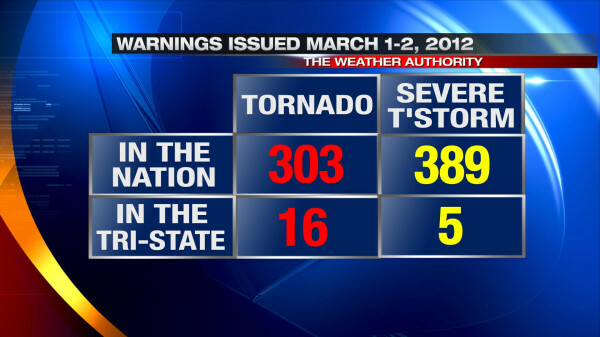 Lastly, March 2, 2012 now stands as the deadliest severe weather day in the Tri-State since official NWS records began in 1950. There is no doubt that this was the biggest event of my career so far and likely will be for the rest of my life. I still get emotional thinking about March 2, 2012. As a meteorologist, you do all you can do to get the word out about severe weather in the days and hours leading up to the event; when anyone dies on your watch, you take it personally and you wonder if you could have done more. I hope that something like what happened on March 2, 2012 in this area never happens again; unfortunately, events like these have happened and will happen again in time. I live in Peach Grove and was home during the tornado. Our family farm received a lot of destruction, as well as damage to mine and 4 other family member’s houses. I was just curious if there is any way to see a re-play of the radar during the outbreak. Weather is facinating to me, and as much as I should have been scared when it was happening, strangely enough I was excited!! I would have loved to have been taking pictures of the entire thing. Obviously, power went out, and wasn’t restored until Tuesday so we didn’t get to see much. And, most of the news afterwards and even today usually doesn’t even mention Peach Grove. I think you all handled the coverage extremely well. Thank you! Like you, I hope something like that doesn’t happen again.